Kalpataru Paramount is a new project at Thane by Kalpataru Group. Kalpataru Paramount is established in the lap of nature and is circled by tall trees and green environments. For Paramount project the bookings open on 14th of April at 12:00 PM, you will need to make a token payment of rs 5 lacs in the favor of Kalpataru Group. This Paramount project is really amazing. Although the room sizes are not so big for 2 bedrooms, the apartments are really affordable and you can expect lots of appreciation in the coming years. 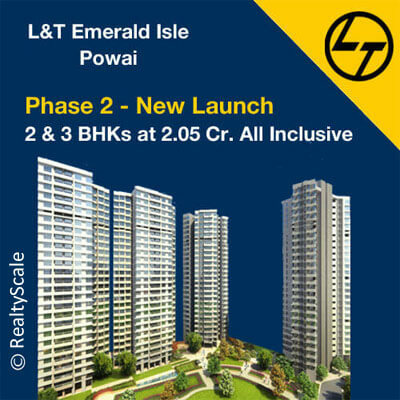 It is located in Kapurbawdi Junction and is right on the main road, the project is close to Runwal Garden City and Big Bazaar of Thane. The floor plans are not released, but we will share with you once they’re out. What we think is that this project is good for people who want an apartment in a tower with good amenities as well as great connectivity towards other parts of Thane and Mumbai. There are three types of configurations, there is a 2 bedroom smart type which has a saleable area of 830 Sq Ft and carpet area of 519 Sq Ft, the base price for this apartment is 84 Lacs, then there is a bigger 2 bedroom Premium apartment which has a saleable area of 1047 Sq Ft and carpet area of 656 Sq Ft it starts at 1.03 Cr., the size of the carpet is less but then again it is affordable. There is then the biggest type of 2 bedroom which comes with a balcony, it will have a saleable area of 1117 Sq Ft and carpet area of 698 Sq Ft the biggest configuration starts at 1.09 Cr. On the day of booking launch, Kalpataru Group saw walkins of 500 customers which is a huge number for the first day opening. Compared to other projects in the vicinity this project is really a unique one as it just has 2 BHK apartments instead of other projects having many configurations. Sunday (16th April 2017) is the last day for the early-bird discount for Rs. 279. This will have all the modern amenities and will be delivered with best architecture. There is a small joke where a person tells his friend that he bought an apartment in an under construction project, and it was at a pre-launch stage, he says that the land is right on the main road, and if compared with the locality’s price the apartment he got was at a very cheap rate. The only thing was the builder was a bit dicey, two years passed by but there wasn’t a single sign of work at the site of land. So tell you the truth it doesn’t matter if the location or the price is good or not as much as the reputation of the builder. We’ve been working with Kalpataru Group over 15 years and they’ve always been trustworthy with the customers, agents etc. We can assure you that the work will be done on the full swing, and the apartments will be delivered on time and could even be delivered before time. Let’s say you book between 14th and 16th of April you get an inaugural discount of Rs. 279 on per square foot rate. You can really consider this project, as Thane is a home to many big companies, there has been a lot of development in the infrastructure of Thane, it isn’t like before. Now the rates of Thane location has increased rapidly, if you had invested in Thane in the past like in 2008 or before 2010 you would have gotten a lot of benefit of the investment. People have been waiting for the launch of this project for a long time, Color Chem Compound is a very well known compound in Thane. The locations of Thane has become a very sought after place in the past few years, it has been attracting the eyes of investors and people with a need of affordable homes with good amenities. You can expect a lot of customers at the site of Paramount project as people will be needing units on lower floors which are cheaper so they don’t have to pay higher floor rise and they get to choose their favorite inventory. This property is different in all phases as it makes you the excellent mixture of a new and modern lifestyle in a context that would permit you to stay near to nature and experience a pollution released living. After a hard tiring day at work or college or school, a person can search the calmness and relax his minds over here. In short, this home is an excellent work for a family to reside in thoughtfully planned living locations amidst natural greenery. Kalpataru Paramount Thane is an excellent place to view every one of your relatives of life and be covered.The enchanting apartments are an excellent variation from the powerful natural life. The apartments are designed in such a way, to the period that they allow the excellent comfortable place for the individuals who choose to want living here. The surroundings are fresh, green and safe. There are even other great projects in Thane like Godrej Emerald and Dosti Desire. The Vastu friendly apartments are different. With connection cross ventilation and reasonable approach for natural light, the move is a part. The apartments guarantee a luxurious atmosphere and a beautiful kingdom. Plant resources inside Kalpataru Paramount at Thane and encounter the happiness yourself. Kalpataru Paramount is completely worked to satisfy your demand and amenities for easy existence. Attached to the unique location benefits that this complex proposes; it also makes the quality of living to lead further heights. With a fundamental developmental style, this project allows apartments that harmonically combine style with opportunism. It is truly said that your home expresses strengths regarding your character and nature; hence Kalpataru Paramount is created to satisfy your different lifestyle and display your exact character to the world. Completely worked, this residential complex is connected to make your normal living satisfied with comfort and happiness. Decorated with all luxurious facilities within the comfortable ability of the residents and tastefully designated characteristics, Kalpataru Paramount is all determined to redefine the definition of beautiful living. Apart from the regular sound and pollution of the city, this township presents you with peaceful and tranquility and satisfies your spirits with ultimate happiness. The project Kalpataru Paramount Thane is a lavish tower that contains apartments that are planned taking care of your requirements and wishes. The residences are worked by specialists who know the choices of a modern resident. Each of the apartments here combines absolutely with each other to create homes that represent beauty beyond connection. Allowing one and all to experience a life replete with happiness, harmony, closeness to all the necessary establishment and secrecy, Kalpataru Paramount is an alluring home option for you and your family. Live life lavishly here along with your loved ones and bring the home wealth of happiness, togetherness, laughter and comfort. Kalpataru Paramount gives the home with a residential apartment that is difficult to obtain outside. These aesthetically constructed apartments have the excellent property connections and attachments which guarantee you don’t have to waste on unnecessary expenses once you leave in here with your family. The apartments are spacious sufficient to accommodate for decent cross-ventilation and assure sufficient flow of daylight and air inside. Kalpataru Paramount is a home proposed for those who need to live a happy life with their families. Kalpataru Paramount by Kalpataru Group located in Thane, Mumbai. It is a project that allows everything inside it. All the services of day-to-day life are possible at an arm’s distance from here without having to choke on the dirt and pollution of city life. Other projects by Kalpataru Group include Kalpataru Aura, Kalpataru Crest, Kalpataru Habitat and others. This aesthetically wonderful project with many of free areas provides you a friendly and laid back experience with your family. The cross-ventilation in all the homes and movement of natural light through daytime performs the home look comfortable and brilliant. This iconic project is an excellent chance for you and your family to live in at Thane, Mumbai. Developed by Kalpataru Group, Kalpataru Paramount proposes plentiful homes in Thane. Designed thoughtfully and created architecturally, it will attach various important moments of you with your loved ones. Worked by professional specialists, this excellent and beautiful production encourages you to sense pleasure and happiness with no settlement in luxury, comfort, and coziness. Paramount Project is very close to Kalpataru Group’s Immensa project. Providing you to observe every moment, every existence area is capacious amplifying natural light and ventilation with complete separation. Well-equipped with man-made amenities, Kalpataru Paramount proposes to the world where your lifestyle will be the improvement a groove higher in Thane. Kalpataru Paramount makes your life the improvidence that begins with a project established where comfort is a motto. The design is brilliantly created to have its facilities combined into the construction for the homeowners. Multiple amenities are developed across the assumptions and each is created keeping efficiency and separation in thought. One can sense at peace transferring between various fields in Mumbai and using them to the absolute. Now you can luxuriate in the enjoyment of a residence that is the greatest of both. The project Kalpataru Paramount provides you the secrecy and openness that you had to have in a living area, and also the facilities that you had to obtain in an apartment building. Kalpataru Paramount is a design which guarantees to grant you a residence of your fantasies. You can appreciate the large area presented in the residence so that you can completely appropriate it. You can even download the brochure for Paramount Thane. The insides and outsides are created in such a way that those who are being here can exist a comfortable life. You can observe the creativity yourself and can experience it with your family. You can create new thoughts here, full of love and satisfaction, which you will appreciate for a lifetime. Apartments are planned in such a way that the inflow of natural sunshine is decent universally, which is a requirement while choosing any apartment. Kalpataru Thane Paramount is designed and created by highly qualified designers and engineers that are well knowledgeable of the property conditions and installation demands of the people. Kalpataru Paramount by Kalpataru Group established at Thane, Mumbai is a representation of harmony, success and good fitness that makes positive vibes with it. These apartments are created to hold in thought your requirements and that will carry your fantasies to actuality. It is the excellent mixture of spaciousness, quality, and efficiency. Being established at Thane, it boasts of a peaceful and relaxed surrounding and is at the same time in uncomfortable proximity to all the happening spaces and enjoys excellent connectivity to all the facilities needed by the resident. Kalpataru Paramount by Kalpataru Group adds purpose to your wealth and attaches importance to your life and your fantasies.